So there was a mysterious smoke clearly visible in north California this evening. It was not the Delta IV rocket scheduled to be launched the very same evening. 4 minutes before the appearance the Delta IV launch was cancelled due to a leak in one of the hydrogen tanks. From the appearance, this was not an airplane malfunctioning but most likely a meteor. This entry was posted in News and tagged 2018-12-19, California, Delta IV, Mysterious Smoke, Night Sky, Rocket. 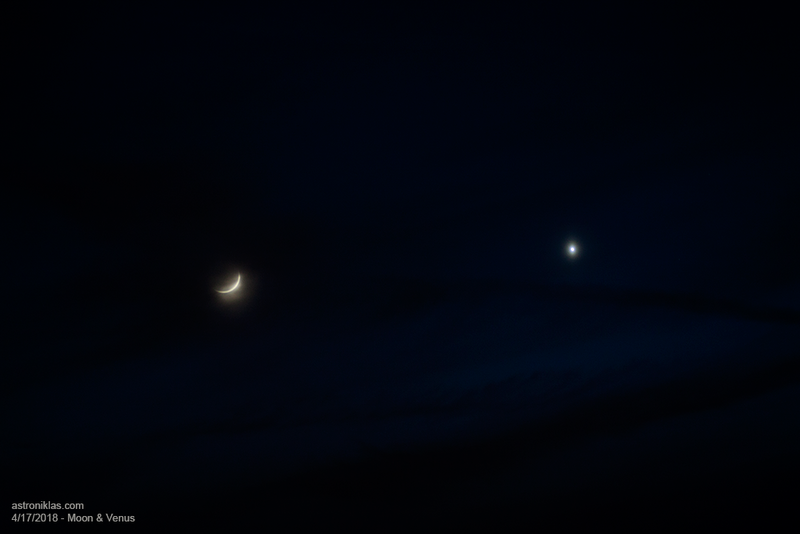 This entry was posted in Astrophotography, News, Observation and tagged Astrophotography, California, Conjunction, Moon, Niklas Henricson, Rancho Cordova, Sacramento, Venus. Next astronomical event will be the alignment between the planetary objects Saturn, Mars, Jupiter, Moon and the star Antares. 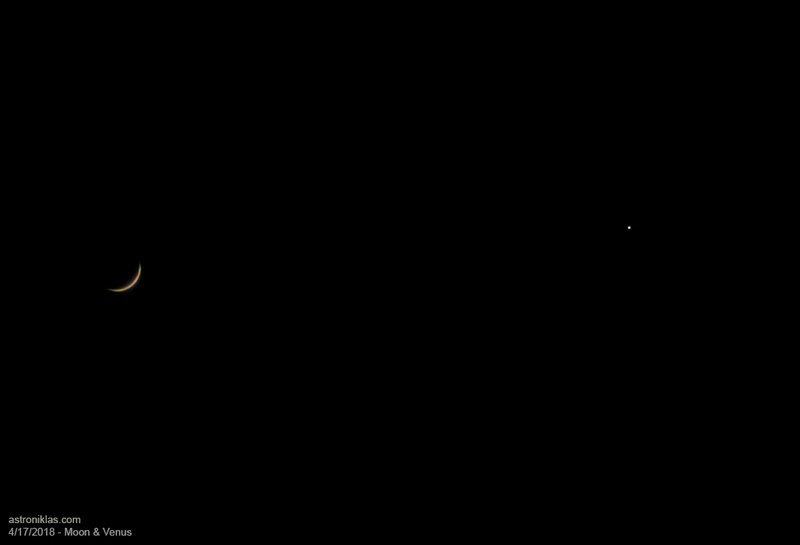 Take the chance to do a wide field photography or study the planets through either telescopes or binoculars to try and see their features. The event will happen on March 7th, 2018 at 4 AM (PST) and can also be observable on the 8th of March as well. Below I’ve labeled all the celestial objects that will line up. This entry was posted in Astrophotography. 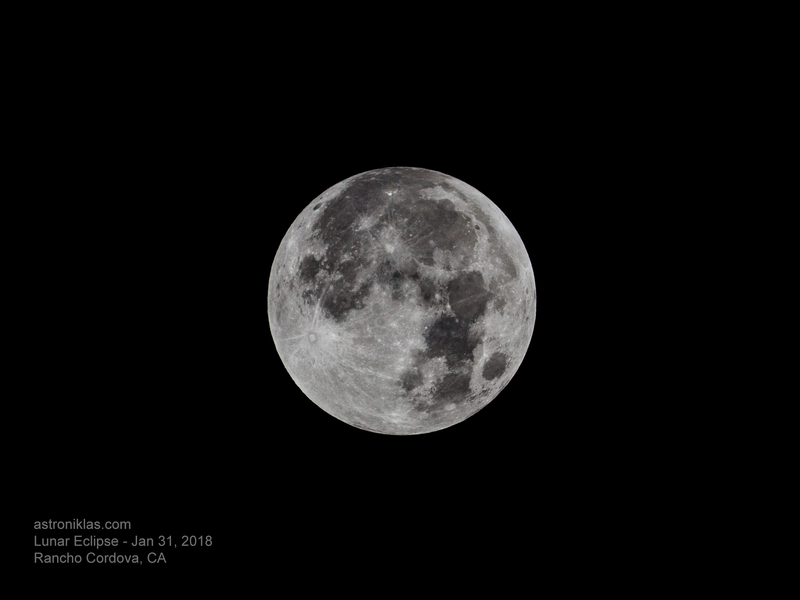 I went off just outside Mather airport and started to set my telescope up. 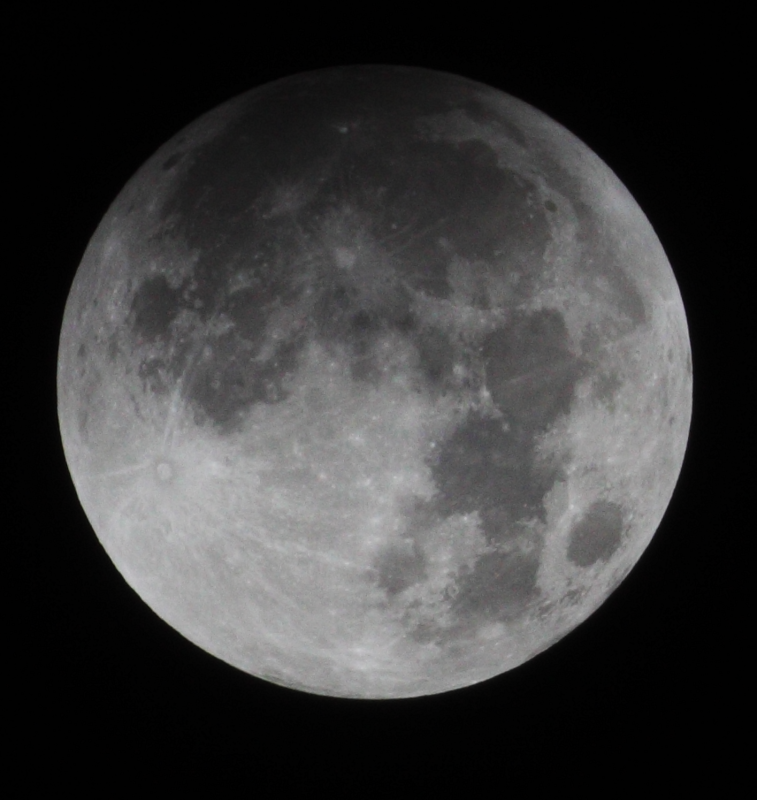 Unfortunately I didn’t have both of my telescopes with me so I couldn’t broadcast live. With me I had my William Optics Megrez 72 APO. The night was very humid, cold but there wasn’t any wind at all. 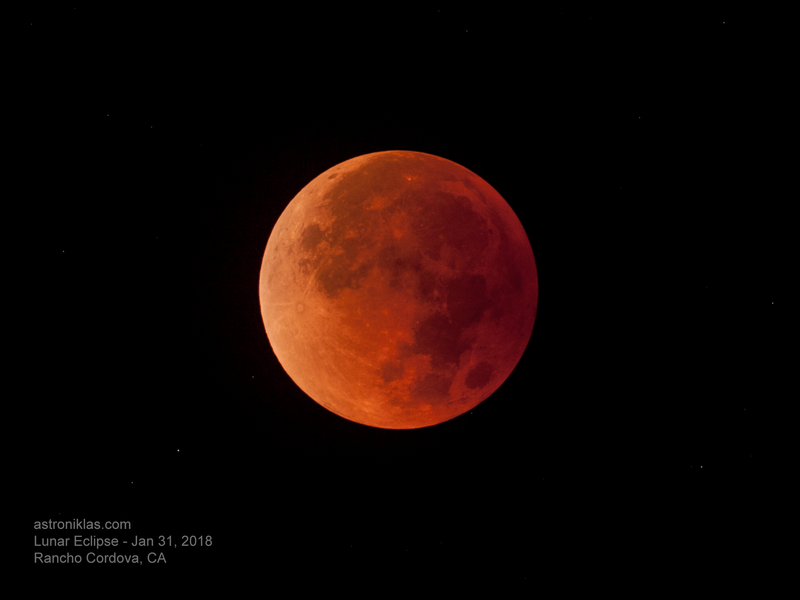 As the eclipse was progressing the moon was turning more and more red/orange. 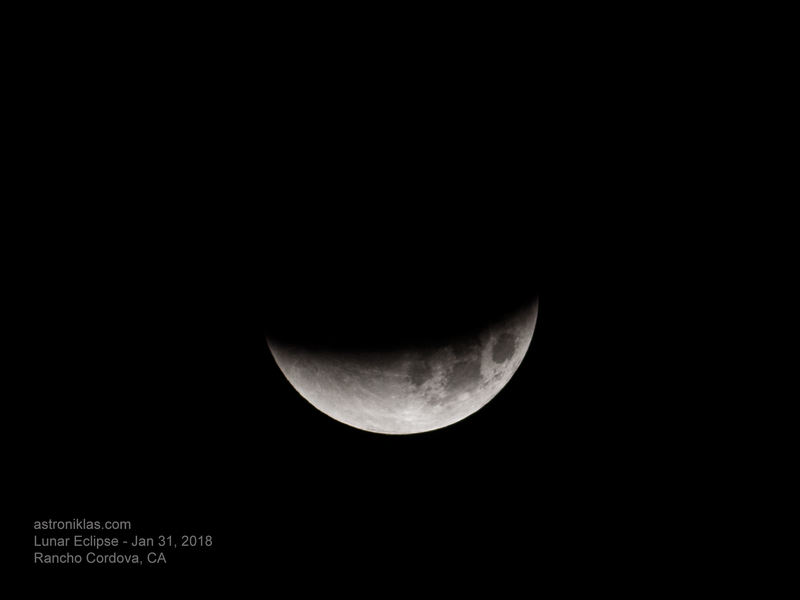 Weather Conditions: Cloud Cover from 40% to 10%, Transparency below average, seeing average 3/5, darkness 4.4 for 0.2 hours and magnitude 4.3 at full eclipse. The humidity was the major disrupting factor this night. 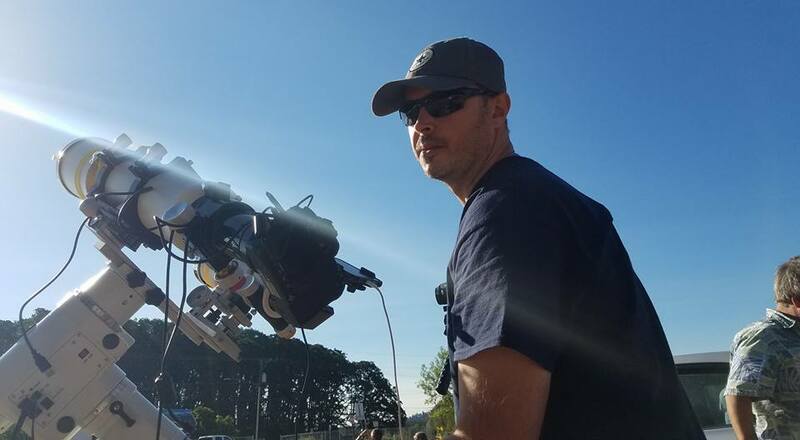 I had to bring in both telescope and camera twice and put the car heater on to get rid the moisture that was on the lenses causing the images to get worse over time. Unfortunately my telescopes are not equipped with a dew heater so over time they accumulate condensation from the surrounding air. Despite that set back the night was remarkably beautiful and quiet. Only the airfield lights and street lights kept shining in the distant background. A few curious bypassing cars stopped to see what I was doing in the darkness and took the chance to look at the spectacle themselves. I must say they were very considerate and turned off their beams to not blind me which I appreciated lots. Thank you! If you don’t know the focal ratio of your telescope/camera lens you can find that out by calculating f = focal length / aperture. 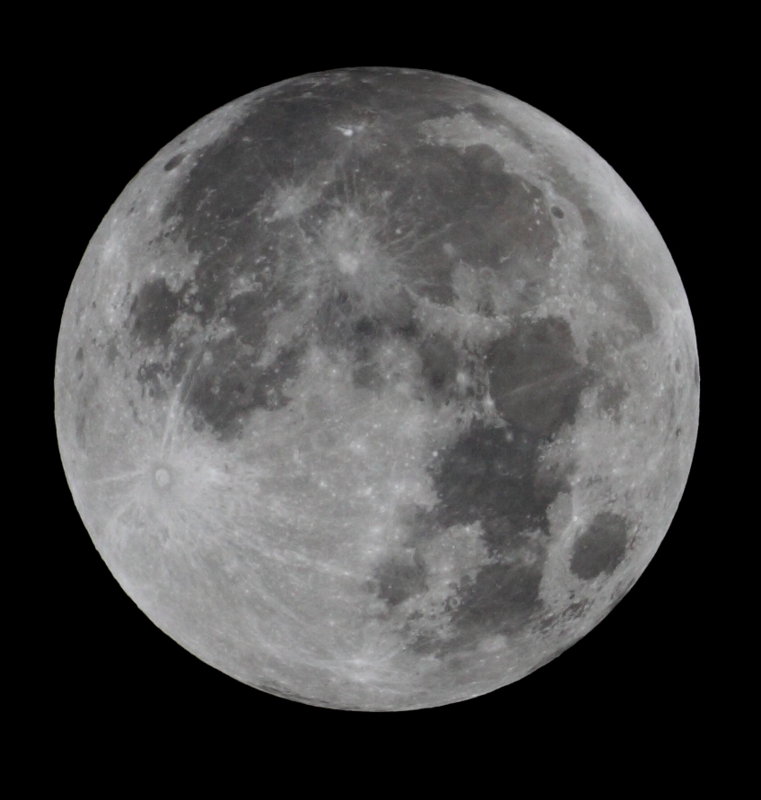 Lunar brightness can be determined through the Danjon scale. 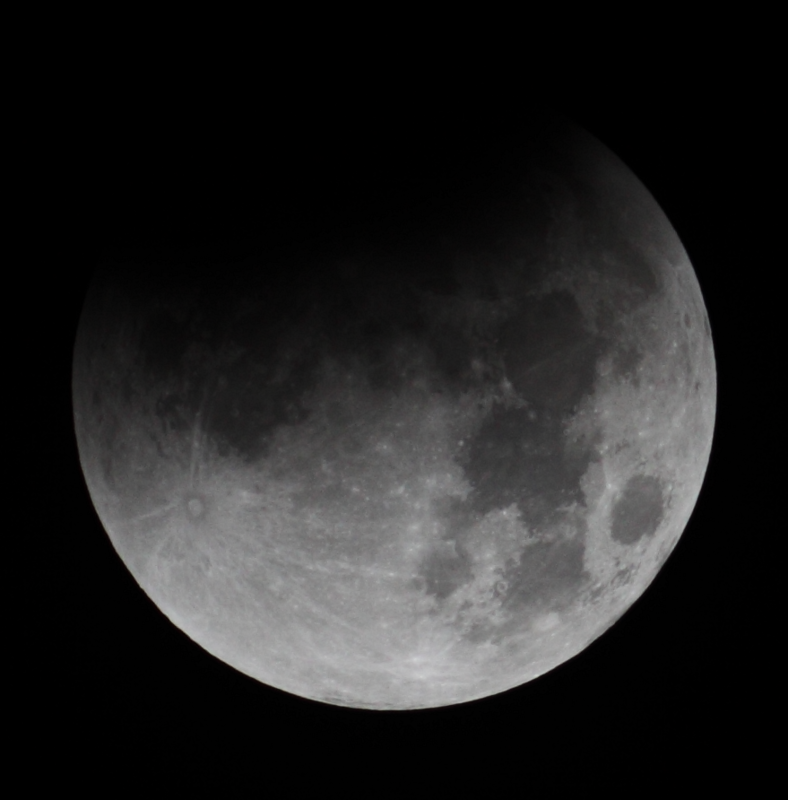 More information on exposures and lunar brightness visit Mr Eclipse website here. Fred Espenak’s table breaks it down very straight forward and simple right here. 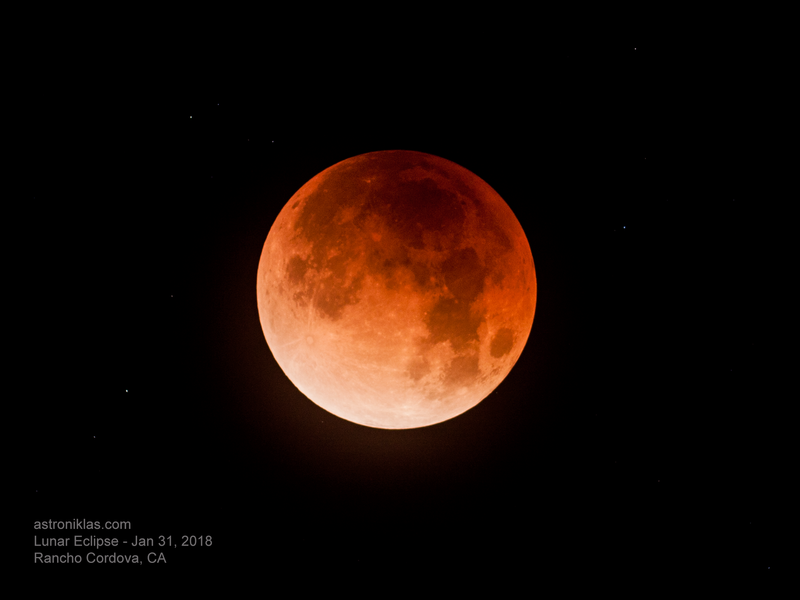 This entry was posted in Astrophotography, Observation and tagged Blue Moon, Lunar Eclipse 2018, Supermoon. 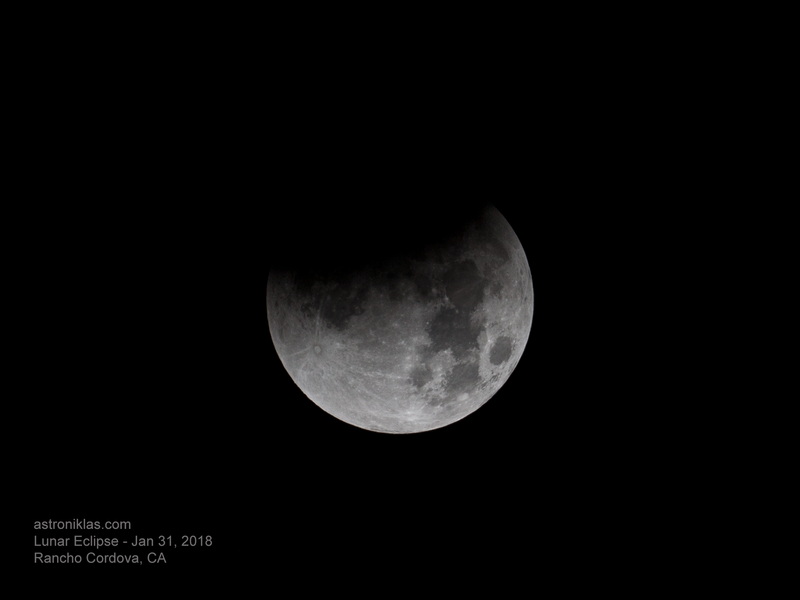 These are the first images now from Sacramento as the eclipse is currently on-going. 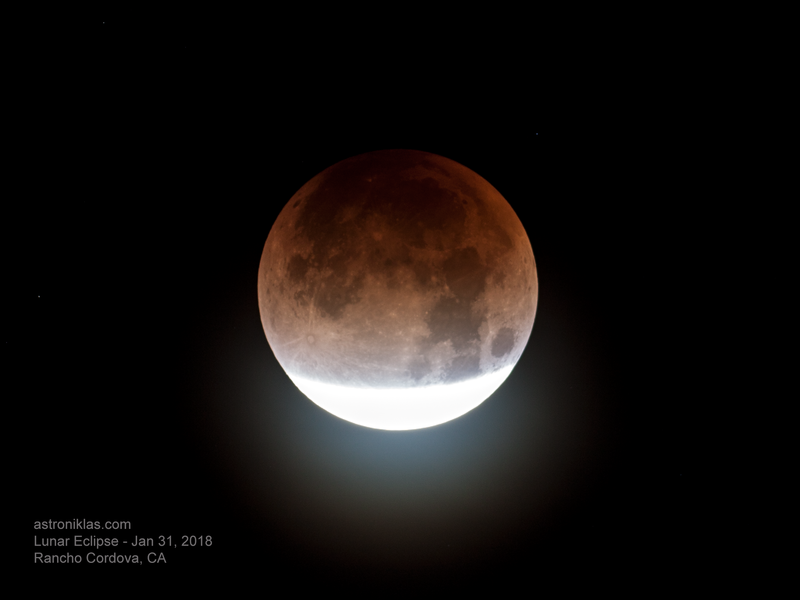 This entry was posted in Astrophotography, Observation and tagged 2018, Blue Moon, Lunar Eclipse, Sacramento, Supermoon.